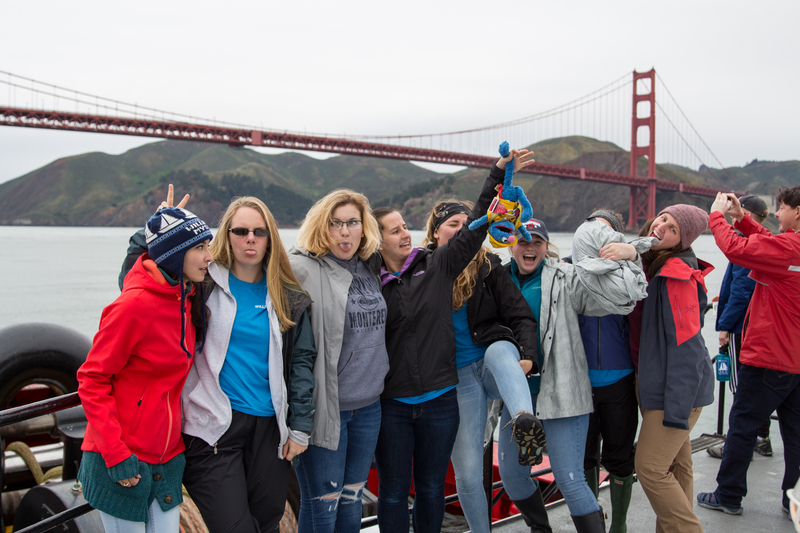 Each semester, about 20 students come to call Mystic, Connecticut home. When not at sea or traveling on field seminars, you’ll live cooperatively in one of five fully restored, 19th-century homes (numbers 3, 4, 5, 6 and 7 on the map below) at Mystic Seaport Museum. Policy class in the Masin Conference Room, just one of many spaces we utilize on Mystic Seaport Museum’s expansive grounds. Our administrative and faculty offices are in Labaree House (2). 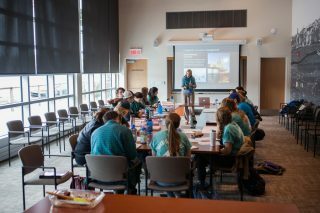 The James T. Carlton Marine Science Center or MSC (8) provides the main classroom and laboratory space for the science classes, in addition to serving as a 24-hour study space. The Masin Room, located in Mystic Seaport’s newly built Thompson Exhibition Building, houses our policy, literature, history and science classes–and boasts beautiful views of the Mystic River Estuary. Sturges Cottage (9) is a 24-hour student life center with workout equipment, games, a television, a piano, a reading nook, and lounge space. All student each receive a free membership at the Mystic YMCA. All of Mystic Seaport Museum becomes your classroom. Its 17 coastal acres and 60 buildings provide a unique and inviting setting for all four of your classes and free time. From our campus, you can walk into town, take a trip to the beach, go for a run along the Mystic River, use one of the Williams-Mystic sailing or power vessels, and enjoy 24-hour access to the Mystic Seaport Museum grounds. There’s nothing like waking up and seeing the outline of tall ship masts outside your window and smelling the salt breezes.